Am I the last blogger out there to post about Kate Spade’s new clothing line for fall? Perhaps, but I still have to add my two cents! After all, I remember my first Kate Spade bag like it was yesterday- I thought I had died and gone to fashion heaven. Steel grey and affixed with that all important black label, I fell head over heels for her at that moment of purchase 12 years ago and never stopped admiring her growing empire! 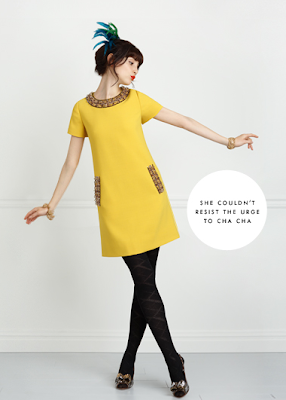 I am absolutely LOVING the Mad Men meets Audrey Hepburn meets Zooey Dechanel aesthetic of this new line. 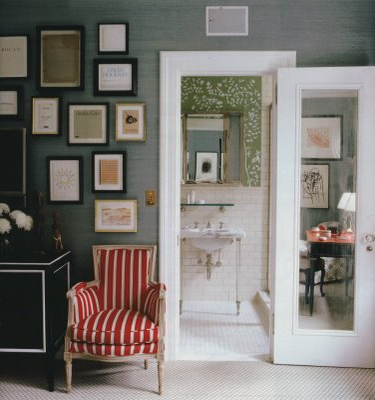 Kate has always had an incredible ability to incorporate many influences into her style to craft a luxurious but whimsically updated WASPy appearance. Stuff you can wear to the preppiest country club or coolest downtown night club and still look perfectly dressed! Needing this little cropped jacket and yellow party dress! This is mere perfection- the classic design but with the bow detail at the back and incredibly fun lining? Get on my back, coat. 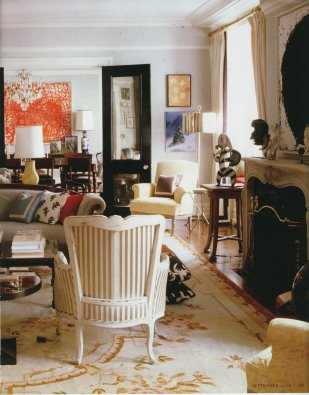 Kate also always brings her visual impact to her personal spaces as well- here are a bunch of my favorite images of Kate’s own homes- note the abundance of gallery style wall hangings, mixture of modern art with traditional furniture, bold color and general sense of FUN. 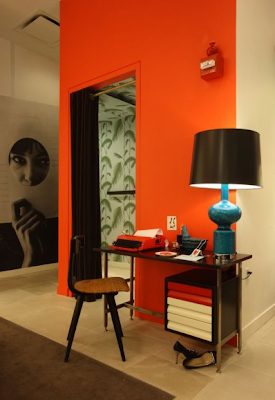 The New York Kate Spade store has also been revamped and I’m loving the addition of a little punch of Palm Springs to the space!!! I could go on and on about her bags, shoes, accessories, dishes, flatware and the like, but unfortunately I have another job other than this blog! :) Viva Kate! 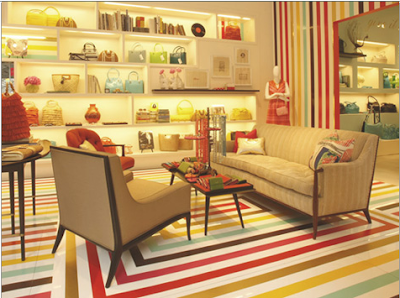 I love Kate Spade and her store is a treat for the eyes! I love her jewelry, too! That trench is fabulous! 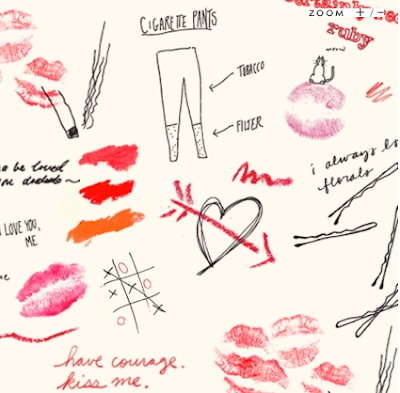 J'adore Kate Spade! All of her lines (clothes, shoes, bags, jewelry, paper home) are so chic. I have 3 or 4 bags and a few wallets of hers that I still use. Great quality. 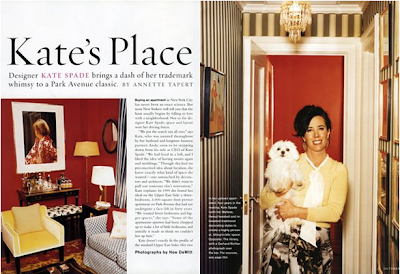 Kate Spade is my idol!!!!! I have loved her for YEARS!!!!! I even got to go to the corp office for a job interview from here in MD…didn't get the job but it was a great experience. Love it! Makes me less afraid of color! 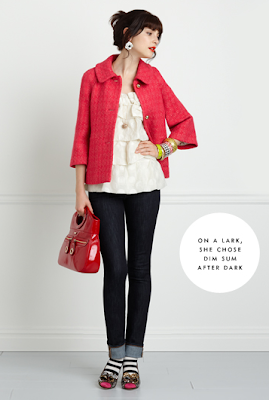 Great post Erin- I do love Kate Spade and the clothing line looks amazing! You outdid yourself in this morning post. What great eye candy. Love Kate Spade. I want to run out and get me some kelly green. Kate can do no wrong in my book. 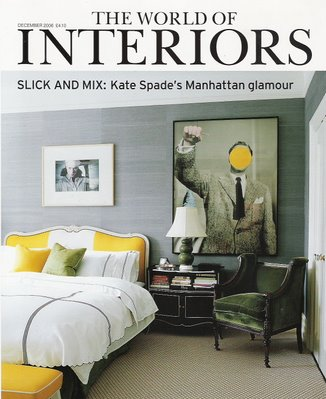 Love the new look as well and blogged about it recently! So much to look at and even though there is so much color, it just works! I like the line. I heart those animal print pumps. I might have to have those. I love all the color! 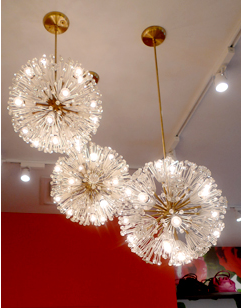 I was just on Kate Spade's site a couple of days ago browsing the jewelry. She has addressed every detail as a brand. She is just amazing! 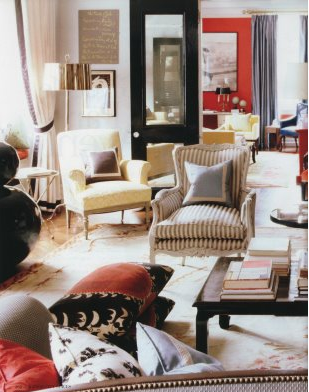 love her line, but her home…wow! 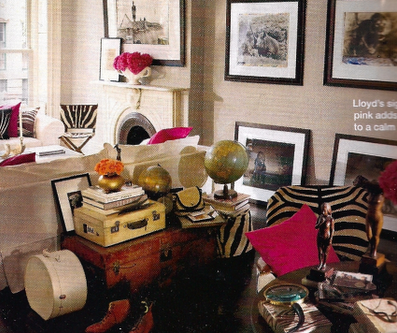 Kate Spade's home is at the top of my inspiration file — thanks for the post! 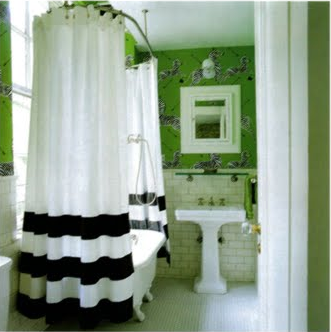 Do you happen to know what the wallpaper pattern is in the picture of the bath with the stripe shower curtain? I looove it and have been looking everywhere for it. i just saw one of the ads in the new Glamour and loved it. Definitely channeling Ms. Audrey Hepburn I think- whom I couldn't adore more! Great post! Wow, she just keeps getting better! 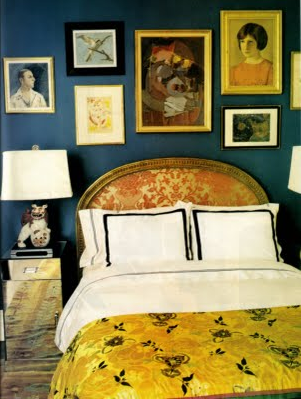 Love her sense of style for the home, too. Wow! I want those clothes! The line also looks a little Jackie O on sweet tarts. I love it! What a lovely collection of images! I really enjoyed your take on KS. 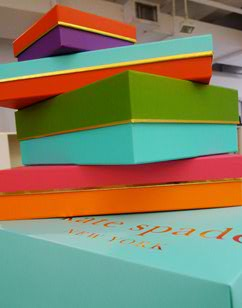 I love the fabulous Kate Spade. I still remember getting my very first Kate Spade purse! The Kate Spade black messenger bag I got for my 16th birthday was my first "designer" bag and I wore that thing TO DEATH. In fact, when a friend did a portrait of me for a class, she drew me with it slung across my body! 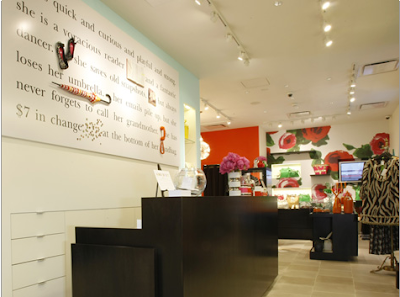 I fell in love with Kate Spade many years ago. Several handbags and wallets later I am still wowed by her! Love the new clothing line…it's so fun looking! You have no idea how badly I want my life to resemble a Kate Spade ad. Such a great-looking clothing line – but, would we expect anything less from Ms. Spade? AWESOME POST!! who doesn't love kate spade!!! This post caused my eyeballs to pop out of my head. I get stuck on that yellow shift dress everytime I see it. And the owl purse. i like your blogs, the lifestyle is very well. . I wanna run out and get me some green.